The Lamiaceae, better known as the mint family, is one of the largest botanical groups and home to some of the most easily-recognized and beloved herbs in the world. It comprises a whopping number of 7,200 recognized species, across 200 genera. Many mint family herbs are of great economical importance, thanks to their ornamental value, high flavor profile, essential oils, and medicinal benefits. Among other defining characteristics, Lamiaceae plants are recognized by their general tendency to have opposite leaves, square stems, and some varieties have a distinctive smell, which is usually pleasant. These herbaceous or shrub-like plants are common in temperate regions around the world. The two main compounds found in many Lamiaceae plants that provide medicinal benefit are the monoterpenoids, found in their essential oil, and phenols. Sage has always been instrumental in the medicinal world, and it has found its way into many multinational cuisines as well. This is a beloved and powerful herb, holding the ability to treat sore throats, indigestion, irregular menstruation, and asthma, to name a few. It has been used both as a gentle tonic and a mild tranquilizer. The antiseptic and astringent properties of sage leaves are great for treating superficial infections and wounds, such as canker sores, sore gums, bug bites, and stings. In recent studies, the anti-inflammatory and antioxidant-rich sage has also shown great potential for use against Alzheimer's disease and the symptoms of menopause. Sage is also great for soothing inflammation, try a sage gargle for sore throat relief. The antispasmodic and antimicrobial properties of peppermint has been traditionally used for relaxing the muscles and relieving tension, as well as for treating infections. The main compound in peppermint is menthol, an essential oil that not only provides a fresh feeling, but also relaxes the gastrointestinal tissue, reducing inflammation. A peppermint tincture for treating inflammatory bowel syndrome (IBS) will help relieve the cramps and bloating that are common in people with this health condition. Darling in the kitchen, basil has a highly aromatic scent. It is most likely native to India, but there are around 150 varieties flourishing around the world. Its principal medicinal action revolves around the digestive system, as it can relieve flatulence, stomach pains, colic, indigestion, nausea, vomiting, and intestinal worms. However, it also interacts closely with the nervous system, effectively treating nervous irritability and fatigue. The effectiveness of a basil and lemon tea against stomach flu has made of this home remedy a favorite for treating this common ailment. Aside from smelling wonderful and livening any dish, rosemary has been used since ancient times as an all-around powerhouse for ailments in the head: faulty memory, poor concentration, migraines, stress, and depression. But rosemary is an invigorating tonic for an array of other body parts and functions, such as blood circulation, adrenal glands, hair growth, sore muscles, and poor digestion. A rosemary tea for memory improvement can also make wonders for your mood. 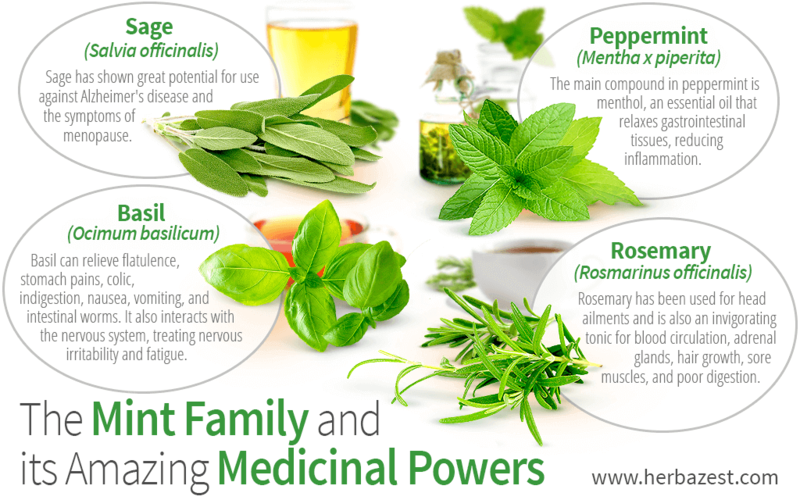 The above four herbs are just a small selection of the plants and the medicinal properties of mint family herbs. Take the hint and stick with mint!